Following a bone-patellar tendon-bone autograft (BPTB) or four-stranded semitendinosus/gracilis tendons autograft (ST/G) anterior cruciate ligament (ACL) reconstruction, the speed and safety with which an athlete returns to sports (or regains the pre-injury level of function) depends on the rehabilitation protocol. Considering the large differences in clinical and outpatient protocols, there is no consensus regarding the content of such a rehabilitation program. Therefore, we conducted a systematic review to develop an optimal evidence-based rehabilitation protocol to enable unambiguous, practical and useful treatment after ACL reconstruction. The systematic literature search identified 1,096 citations published between January 1995 and December 2006. Thirty-two soundly based rehabilitation programs, randomized clinical trials (RCT’s) and reviews were included in which common physical therapy modalities (instruction, bracing, cryotherapy, joint mobility training, muscle-strength training, gait re-education, training of neuromuscular function/balance and proprioception) or rehabilitation programs were evaluated following ACL reconstruction with a BPTB or ST/G graft. Two reviews were excluded because of poor quality. Finally, the extracted data were combined with information from background literature to develop an optimal evidence-based rehabilitation protocol. 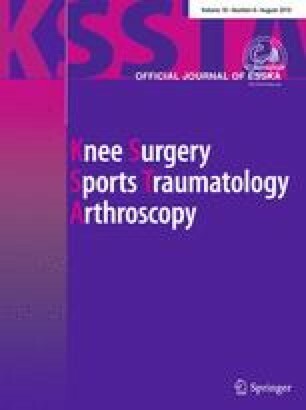 The results clearly indicated that an accelerated protocol without postoperative bracing, in which reduction of pain, swelling and inflammation, regaining range of motion, strength and neuromuscular control are the most important aims, has important advantages and does not lead to stability problems. Preclinical sessions, clear starting times and control of the rehabilitation aims with objective and subjective tests facilitate an uncomplicated rehabilitation course. Consensus about this evidence-based accelerated protocol will not only enhance the speed and safety with which an athlete returns to sports, but a standardized method of outcome measurement and reporting will also increase the evidential value of future articles. The online version of this article (doi: 10.1007/s00167-009-1027-2) contains supplementary material, which is available to authorized users. We thank Anne Benjaminse, PT, MSc for her translation efforts. Information about the rehabilitation (discuss mutual expectations). Emphasize that knee rehabilitation is more than strength-training of the upper-leg muscles alone. The (neuromuscular) rehabilitation addresses the whole lower extremity, core stability and training of the kinetic chain. Decrease of pain, swelling and inflammation. Achieve/maintain normal range of motion (ROM) with a focus on good patellar mobility. Maintain muscle strength, prevent atrophy. Training of the first-days postoperative exercises (i.e., heel slides, straight-leg raising (SLR), squads, leg elevation with a pillow under the heel). Emphasize the importance of full extension. Practice alternate walking with crutches for the first days postoperatively. Tests: VAS-score pain; ROM; measurement of knee swelling; IKDC questionnaire; hop tests and optional isokinetic tests for strength and endurance of the knee flexors and extensors. Control of pain and inflammation (i.e., through cryotherapy and exercises). Obtain ROM of 0º–90º, emphasizing achievement of full extension (i.e., through CPM and exercises: patellar mobilization in all directions, heel slides and leg elevation with a pillow under the heel). Regain muscle control, with safe isometric and isotonic OC (ROM 90º–40º) and CC (ROM 0º–60º) strength exercises without additional weight. (i.e., SLR, mini squads, shifting body weight). Improve gait pattern. If pain is tolerated, aim at walking without crutches from day 4. Sufficient neuromuscular control and a non-limping gait pattern are criteria for walking without crutches. Pain knee is equal to previous week or less (VAS-score pain). Minimal swelling (measurement with measuring tape). Full extension and 90º flexion are possible (ROM-goniometer). Good patellar mobility compared with contralateral side. Sufficient quadriceps control to perform a mini squad 0º–30º and SLR in multiple directions. Ability to walk independently with or without crutches. Apply cryotherapy in case of pain or swelling (if necessary after each therapy session). Work toward full ROM (maintain full extension, 120º flexion from week 2 and 130º flexion from week 5) with remaining attention for good patellar mobility. Walking without crutches from day 4 to 10. Normalize gait pattern with walking exercises (treadmill from week 3 and jogging in a straight line from week 8). Isometric and isotonic strength training increasing in intensity (quadriceps, hamstring, gastrocnemius and soleus), with increasing ROM for OC and CC exercises without extra weight. For OC exercises: weeks 2, 3 and 4 from 90° to 40°, afterward 10° toward extension to be added every week. For CC exercises: weeks 2–7 from 0° to 60° and from week 8 from 0° to 90°. Start neuromuscular training by slowly increasing from static stability to dynamic stability. Work toward confidence on the vestibular and somatosensory system for balance, with increasing surface instability and decreasing visual input. Start from week 3 with cycling on an ergometer and swimming. Start from week 4 with stepping on a stair-stepping machine. Start from week 8 with outdoor cycling. Caution: act adequately in case of persisting pain, inflammation or limited ROM → there is a risk of developing arthrofibrosis (in case of doubt consult the orthopedic surgeon)! Minimal pain and swelling (VAS-score pain, measurement of knee swelling with measuring tape). Full extension and at least 130º flexion possible (ROM-goniometer). Exercises of previous week are carried out properly. Obtaining and maintaining full ROM. Optimizing muscle strength and endurance. Add increasing weights from week 9 both for OC and CC exercises. Neuromuscular training with increasing emphasis on dynamic stability and plyometric exercises, slowly increasing duration and speed. Start with two-legged jumping and work slowly toward one-legged jumping. Normalize running with outdoor jogging from week 13. No pain or swelling in the knee (VAS-score pain, measuring knee swelling with measuring tape). Full flexion and extension of the knee (ROM-goniometer). Administer the IKDC questionnaire again. Quadriceps and hamstring strength >75% compared to the contralateral side. Difference in hamstring/quadriceps strength ratio is ≤15% compared to the contralateral side (optional isokinetic strength testing of knee flexors and extensors at 180º per second). Hop tests >75% compared to the contralateral side. Maximizing muscle endurance and strength. Maximizing neuromuscular control with emphasis on jumping, agility training and sport-specific tasks. Variations in running, turning and cutting maneuvers are allowed. Duration and speed to be increased and maximized. No pain or swelling (VAS-score pain, measuring knee swelling with measurement tape). Full flexion and extension of the knee is possible (ROM-goniometer). Quadriceps and hamstring strength >85% compared to the contralateral side. Difference in hamstring/quadriceps strength ratio is <15% compared to the contralateral side (optional isokinetic strength testing of knee flexors and extensors at 60°, 180° and 300° per second and an endurance test at 180° per second). Hop tests > 85% compared to the contralateral side. Exercises of previous week are carried out properly, and the patient tolerates sport-specific activities and agility training with maximal duration and speed.